Ladies and gentlemen, this is the single best deal on a high-quality tablet we’ve seen sine Prime Day, and the odds are pretty good that it’ll be the best tablet deal we’ll see all year until Black Friday rolls around. 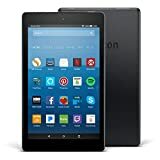 In a surprise move, Amazon has slashed $50 off the price of the insanely good Fire HD 8 Tablet With Alexa, dropping the price to $60 from $110. But wait! Use the coupon code SAVE10OFF at checkout and you’ll snag a Fire HD 8 for only $53.99. That’s a crazy-good price for such a fantastic tablet, so definitely grab one while you can.